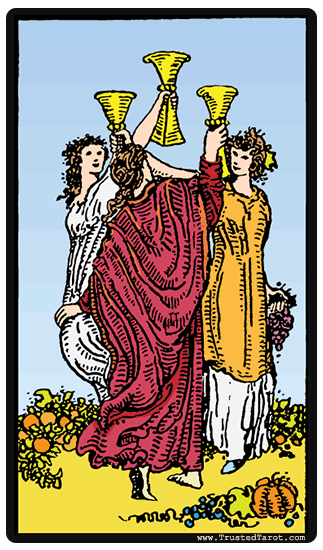 When you draw the Three of Cups, you will see three women lifting their cups up in the air in a celebration of some sort. Good times are in the air, for the three ladies have wreaths made of flowers in their hair. Wreaths are often associated with success and victory, so their happiness is well deserved. The ladies are also seen standing on top of a field of flowers and fruit, further adding to the joyful feelings in this card. There are feelings of beauty, growth, compassion and happiness that the women share between each other. An interesting note though, in the Rider-Waite the woman in the middle is turned away from the reader and her face hidden from view. However, the two other maidens are seen smiling. The meaning behind the Three of Cups represents a period of happiness. You will be able to forget the worries of your daily life and spend quality time with family and friends. To see the Three of Cups can indicate a happy reunion with a long lost friend, relative, or loved one. It can also mean a celebration, whether it is your own or for someone who you love. The event can be a birthday, wedding, or any other happy occasion. In general, it is about spending quality time with people you cherish in your life. The Three of Cups is about spending quality time with people you cherish in your life. The three maidens represent your circle of friends who you turn to for love, compassion, and support when you need them the most. It can be old college buddies, colleagues at work, or people you have shared a special bond over the years. If you've had problems with your social life, this card can signal the end of those hardships. You will be able to resolve differences and learn how to deal with the problem. When the Three of Cups is reversed, it means that you may have no time to socialize or go out with friends. You may be too busy with school or work that you can t spare some time to have fun. The Three of Cups reversed can also mean losing touch with some of your friends. As time passes, you may find that you are growing apart from one another. When we grow older, we must put in effort to make sure that our friendships are not neglected. Alternatively, the Three of Cups reversed can mean that there is a lack of balance and harmony within your social circle. Gossip and scandal can rear their ugly heads. Perhaps there is envy hidden within this circle, and as a result, you are feeling isolated.